Hyderabadi Vegetable Dum Biryani is a delicious medley of succulent vegetables, spices, ghee, saffron and flavourful basmati rice which no one can resist. Here is how to make a restaurant style spicy recipe to make Vegetable Biryani at home. Did you know that Biryani is actually a Persian word and it’s a dish that was brought to us by the Mughals? Even our very own Hyderabadi biryani has its strong Mughlai and Iranian influences, but nevertheless this rich and aromatic layered dish coupled with a few accompaniments makes for a delightful afternoon lunch or dinner. A rather elaborate recipe that requires you to marinate the vegetables and layer it with rice, don’t get me wrong, but this dish is absolutely worth it. Just the aroma of ghee being combined with spices and herbs wafting in the air will tickle your taste buds. Today I present to you an authentic recipe of the Hyderabadi dum biryani with a vegetarian twist, Hyderabadi Vegetable Biryani. The use of vegetables instead of meat gives this dum biryani a lighter and more exuberant taste. Do check out some of my other interesting biryani recipes as well – Raw Jackfruit Biryani and Hariyali Jheenga Biryani. I’ve also posted recipes for a Hyderabadi Mutton Biryani, Fish Dum Biryani, Egg Dum Biryani and a Mutton Dum Biryani if you’re looking at incorporating some non-vegetarian elements in your biryani. Traditionally the dum biryani is slow cooked in a handi and covered completely so that no steam is allowed to escape. 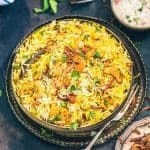 This is what gives the Hyderabadi Veg Biryani its unique taste and royal flavour. This version of the Hyderabadi veg biryani is simpler, yet nothing short of traditional. 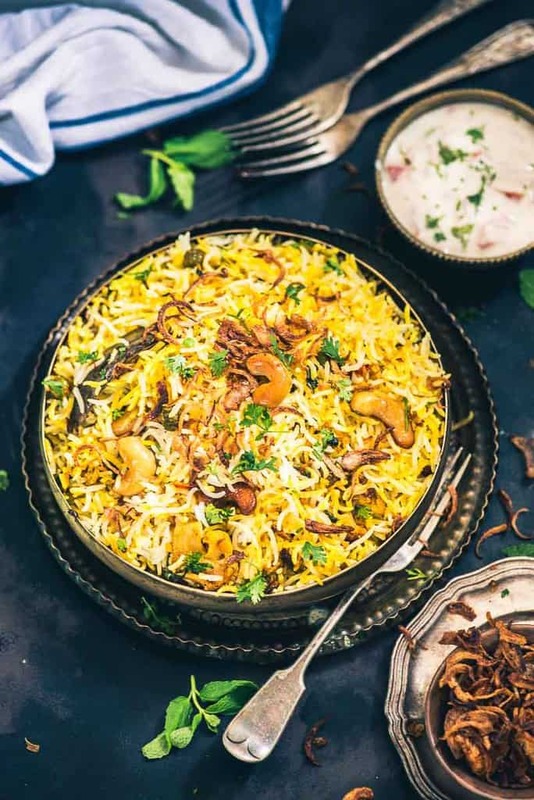 Made using vegetables that are cooked with some aromatic spices, later layered with saffron infused basmati rice and oodles of love, this biryani has just the perfect mix of the most sensational flavours. For me cooking a biryani is just incredibly satisfying, it’s one dish that requires some effort but the results are nothing short of delightful. It’s an extremely popular rice dish that is enjoyed by everyone, trust me when I say this, but there are very few people out there who don’t like biryani. This veg biryani recipe calls for two cups of basmati rice and the better aged the rice the better it’s going to taste. Also the key to making this vegetable biryani absolutely delicious is to make it with lots of love. Some of you might start a debate stating that there is no such thing as a veg biryani, but as legend has it, this was the biryani that some of the vegetarian workers who were working for the Nizam’s made for themselves and they sure did call it vegetable dum biryani. Well I believe that it doesn’t matter what you call it, as long as it tastes absolutely mouth-watering, like this one here. How to choose rice to make best Veg Dum Biryani Recipe? Both the taste and visual appeal of Biryani should stand out in its preparation. Now while this recipe takes care of the taste, the visual appeal comes only through rice grains. Longer the grain, better would be the biryani. I always choose the rice which is extra long and stands out as individual grains. This gives the visual appeal of a blooming flower and makes eating biryani an enjoyable experience. Hence Basmati rice is the best choice to make Biryani, it stands out individually, without forming lumps while cooking. In the market, you now even get specially selected long grain Basmati Rice, which is perfect for this Biryani. I have used Fortune Biryani Special Rice to make this Biryani. The age of the rice is also very crucial to make good biryani. Choose the rice grain which is at least 1 year old. The older the rice, the better it is. Hyderabadi Vegetable Dum Biryani is a delicious medley of succulent vegetables, spices, ghee, saffron and flavourful basmati rice which no one can resist. Fry the vegetables on high heat for 4-5 minutes. Remove the vegetables in a bowl. Mix the ingredients for marinating in a bowl. Add the vegetables in it and mix well. Cover and keep aside for an hour. Wash the rice and soak in enough water for 30 minutes. Add cloves, bay leaf, cinnamon stick and fry for a few seconds. Drain the rice and add in the pan along with 4 cups of water, lemon juice and salt. Cover and cook only heat until 80 % done. Add the marinated vegetables in a heavy bottom pan. Sprinkle coriander leaves, mint leaves, saffron soaked in milk, fried onion, fried cashew nuts and raisins on top. Cover the pan tightly with a lid. Keep a griddle over low flame. Keep the pan over the griddle and let the biryani cook for 15-20 minutes. Fluff with a fork gently to mix the layers. Serve hot with Onion Tomato Raita. I wanted to ask do you use store bought fried onions or make them at home? Delicious! Labor intensive but worth it, the raita really put it over the top. Now I’m thinking leftovers with chicken tandoori. Who has a good recipe? Oh yes. You can do sandwiches or tarts with leftover tandoori chicken. One of my fried has suggested me to ad curd once the vegetables are backed. Is it true? Do we need to add curd? Vegetable Biryani is not a traditional recipes. It got developed later, so basically there are no rules. You can try and see which recipe and process works for you best.